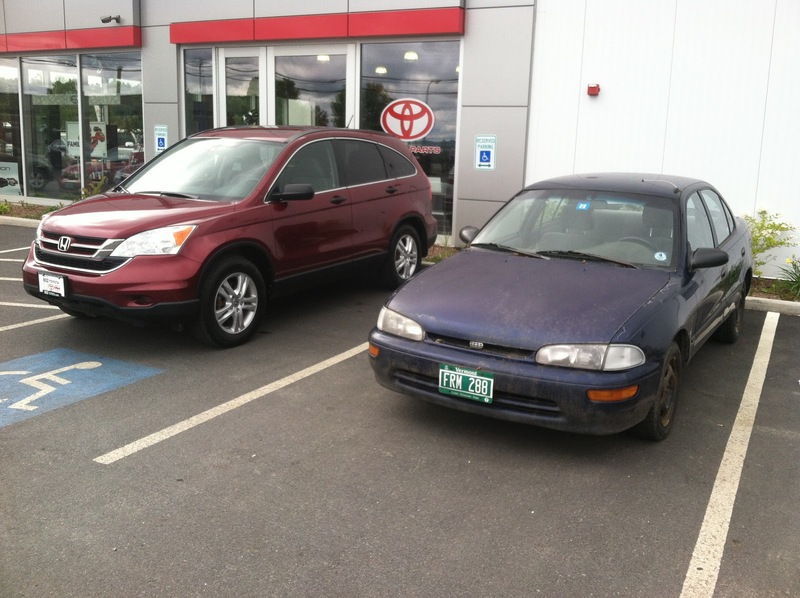 The Barn Car is Dead; Long Live the Barn Car! 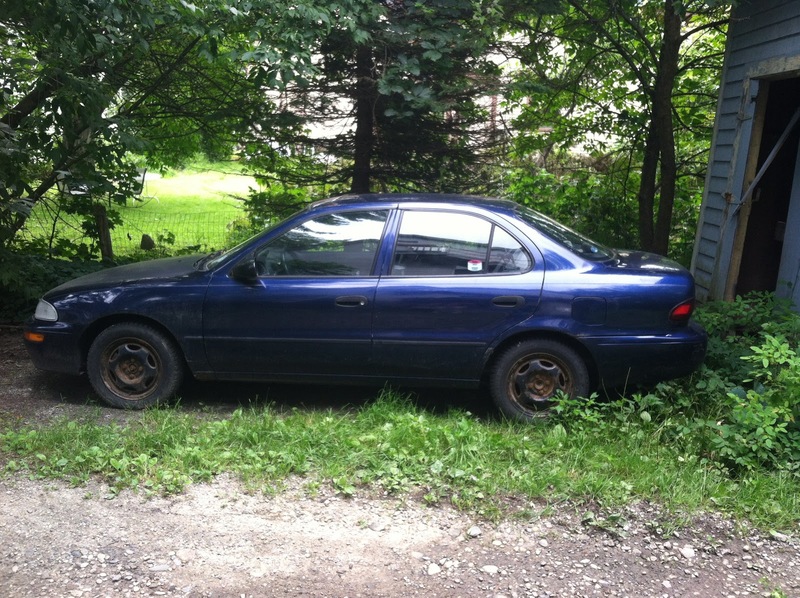 Then at the end of the day, I sat in a 1997 Geo Prizm (in 2005). It had 70k miles on it already and on paper would not have been the right car. I saw it across the lot, thought “hmmmm,” and went and sat in the driver’s seat. I knew instantly that this was my car. Formalities were observed: we took it on a test drive down to the local library and looked up the Consumer Reports, negotiated with the dealership, but it was all a foregone conclusion. Taken from this angle you can’t tell that she has no clear coat and a dent on literally every single panel. Whew. If you’ve made it through that sentimental wall of text, I applaud you. I’ve also done some burying of the lead. Yesterday, I brought Callie to the dealership and left her there, and came home with a new car. She’d been declining precipitously for a good year and a half. Parts were failing faster than I could keep up. She caught on fire twice. (Well, not actual flames, but HUGE clouds of smoke billowing from under the hood within seconds; close enough!) For the first time ever, she left me stranded on the side of the road and had to be towed to a mechanic. I opted out of the substantial work she needed to pass inspection and parked her starting in April. After 9 years and 157,000 miles together, it was time. I’m not saying I didn’t cry like a baby when I was driving away, knowing she was going to be broken up for parts. I get sentimental about these things. When I was 10 or so, my parents traded in the family van I had grown up with. I had to be forcibly removed from the car, I was sobbing and had my arms wrapped around the seat. Maybe not my proudest moment. Old on the right, new on the left. 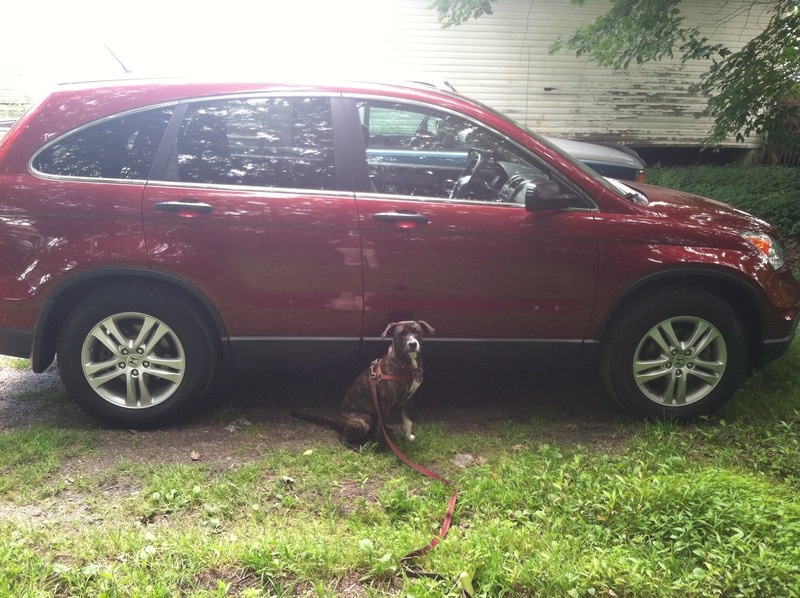 Molly is a 2011 Honda CR-V, chosen because I live in Vermont and the barn is many miles of dirt road away. Also, there is an actual policy on the part of the state to plow less in order to force people to drive more safely. Yes, really. It’s not at all uncommon to have several inches of snow on the road and just go about your daily business. Arya approves, though it may be some weeks before I’m willing to let muddy puppy paws on the freshly detailed upholstery. Next Post Is My Horse Forward? RIP car, I hate when they die but sounds like you got a ton out of her. I almost wish WV had that kind of policy…except we kind of do in an unofficial way – not enough money to budget for enough plows/drivers. So the roads get crazy anyway. Buckle up for a predicted wicked winter! Hope Molly is ready. Thank you! I'm really pleased with it! Yeah, the car was named for miniseries/season 1 Callie, not what she became later, ugh. I sort of stopped watching BSG in season 2 anyway, too dark for me! Prizm held up way way WAY better than she should have, may she go gently to that great junkyard in the sky. Sometimes it's fine, but other times it's really, really frustrating. It is at least half because Vermont has a tiny tax base/no money, too. Sometimes I think that's how it got started and then they just handwaved it as a safety decision.